Ala Moana Beach Park closed late last night for heavy maintenance that will last through tomorrow afternoon. 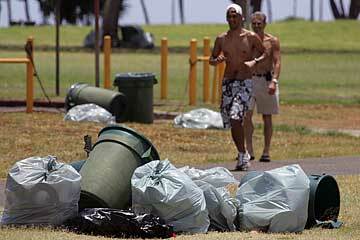 Yesterday afternoon, trash bags could still be seen scattered in the park. HAMPTON, Va. » A Hawaii-based Air Force enlisted man was sentenced yesterday to 10 years in prison for killing a fellow airman in their living quarters in Iraq by shooting him in the chest with a 9 mm pistol. Kyle J. Dalton also was given a dishonorable discharge and a reduction in rank from senior airman to airman basic and ordered to forfeit all pay and allowances, said Maj. John Elolf, an Air Force spokesman. Dalton pleaded guilty Monday to involuntary manslaughter and violating a lawful general regulation by drawing or aiming a firearm when deadly force was unnecessary. He faced up to 12 years in prison. In exchange for the plea, Air Force prosecutors dropped charges of murder, which carried a maximum punishment of life in prison, and assault. Dalton told the judge at his court-martial that he thought his service pistol was unloaded when he pointed it, playfully, at 22-year-old Senior Airman Carl J. Ware of Glassboro, N.J., on July 1, 2006, and pulled the trigger. Ware and Dalton were stationed at Hickam Air Force Base and were part of the 886th Expeditionary Security Forces Squadron at Camp Bucca, where they guarded detainees. The Air Force held the court-martial at Langley Air Force Base in Hampton to make travel easier for witnesses. The service declined to release Dalton's age and hometown, citing privacy regulations. The 1,450 registered professional nurses who work in the state's community hospitals and health centers will receive a 5 percent pay raise in July and an additional 4 percent in July 2008, according to provisions of a contract awarded by an arbitration panel. The members of Collective Bargaining Unit 9 will continue to be able to move up the pay scale as they accrue years of experience, and on Jan. 1, 2009, two new steps will be added to the scale. The award also increases night differentials, meals and travel per diem. The award is binding and does not require ratification by the bargaining unit. The state will spend more than $5.5 million for repair and maintenance projects at four Maui schools, Gov. Linda Lingle has announced. » Air conditioning and electrical upgrades at Lokelani Intermediate School. » A telecommunications system and electrical power upgrades at Lahaina Intermediate School. » Drainage improvements for various buildings at Kahului Elementary School. We would like you to share your memories and photos of Don Ho. The Star-Bulletin will be publishing stories and photos celebrating Don Ho's life, and we want to hear from readers about how you remember the legendary entertainer. E-mail your comments and photos to donho@starbulletin.com, or mail to Honolulu Star-Bulletin, 500 Ala Moana Blvd. Suite 210, Honolulu, HI 96813. Please limit your contributions to 100 words or less. On Monday, Gov. 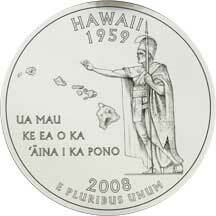 Linda Lingle chose the likeness of King Kamehameha the Great to grace the Hawaii state quarter, to be released in fall 2008. We wanted to know what you thought of the design: here's how you voted yesterday on starbulletin.com. This vote represents the opinions of the 1,695 who participated. Beverly Ann Lapuz of Kapolei High won first place in the 26th Annual Congressional Art Competition for public high school artists. She and her teacher, Amanda Kim, will attend a ceremony in Washington, D.C., in June. Her photograph will be part of a yearlong exhibit at the U.S. Capitol. Casey Nishikawa of Baldwin High on Maui was named first runner-up. Her painting will hang in the Washington office of U.S. Rep. Mazie Hirono, honorary chairwoman of the 2nd Congressional Art Competition. Cyndi Kohashi of Waiakea High in Hilo was selected as second runner-up. Her painting will hang in Hirono's Honolulu office at the Prince Kuhio Federal Building. Chris Ballesteros of Damien Memorial School won awards in the state forensic speech and debate finals in three categories: U.S. extemporaneous speech, public forum debate and impromptu speaking. He will compete at the nationals in Wichita, Kan. Winners of the Library of Congress Letters About Literature Contest were: Jenna Bleu Forti, a fifth-grader at Aina Haina Elementary; Gerrit DeWeese, a seventh-grader from Kahuku High and Intermediate; and Sarah Panoke, a sophomore at Nanakuli High and Intermediate. The search for a missing 21-year-old Japanese woman continued yesterday in Windward Oahu and Pupukea. Police have been searching since April 12, when Masumi Watanabe disappeared after a walk in the neighborhood. The woman was staying with family friends in Pupukea when she disappeared. The search has included volunteers, Department of Land and Natural Resources enforcement officers, and Honolulu Fire Department's helicopter and fire and rescue personnel. A 26-year-old man who is suspected in several home burglaries in Kailua has turned himself in at the Kailua police station. The man was booked on suspicion of three counts of burglary Monday. He allegedly broke into three houses, but police said they believe he is responsible for other burglaries in the area near Kailua High School. Police said the man and a 30-year-old woman were burglarizing an Uluopihi Loop house on April 18. A former police lieutenant who lives next door caught and detained the woman until patrol officers arrived, but the man got away. Officers arrested the woman on two counts of burglary. Police said they identified the man, contacted him and told him to turn himself in, which he did Monday. A car reversing out of a parking stall in Laie tapped a stroller yesterday, causing 5-month-old twin babies to partially fall out, police said. The accident occurred at 7:18 p.m. on Kulanui Street in a dimly lit area on the Brigham Young University campus, police said. The babies were examined by emergency personnel and were fine, police said. A friend of their mother had been walking the children across the BYU parking lot, police said, when they were hit by a Ford Focus driven by a 29-year-old BYU student who lives on campus. The mother and her babies also live on campus, police said. Police found a decomposing body in Kalaeloa yesterday, and have yet to make a positive identification. The man's body was found face up about 9:45 a.m. yesterday by a man collecting bottles and cans in the grassy area near the intersection of Roosevelt and Tulagi avenues. Police said they couldn't tell if foul play was involved because the body was decomposing. Investigators also couldn't confirm the man's identification, but he was found with the Alaskan ID card of a 50-year-old man. The case is still considered an unattended death. Police arrested a 25-year-old woman after she and two men allegedly kidnapped, assaulted and threatened a woman who is eight months pregnant. At about 2:57 p.m. Monday, the suspects abducted the 25-year-old at Salt Lake Boulevard and Puuloa Road, police said. According to a police report, the suspects kicked and stepped on the victim's mid-section several times and threatened her with a handgun. The victim was released about 30 minutes later, and was in good condition. Police said the victim's ex-boyfriend, who is the father of her unborn child, had called to report the incident after his current girlfriend told him what she had done. Police said he is not a suspect. Police arrested the woman for investigation of kidnapping, terroristic threatening and violating a temporary restraining order. They were looking for the two men who helped in the attack. Police arrested a 49-year-old Hauula man for allegedly cutting a security guard with a knife at Straub Clinic and Hospital Sunday afternoon. Police said the 24-year-old security guard was trying to stop the man from re-entering the hospital about 12:45 p.m. The suspect allegedly pulled out a knife and threatened the security guard, who wrestled the weapon out of his hand and suffered a minor cut to the thumb, police said. They arrested the suspect for investigation of second-degree assault. About 50 firefighters rushed to a grease fire at a Waikiki restaurant that forced a brief evacuation of a high-rise building yesterday afternoon, a fire official said. 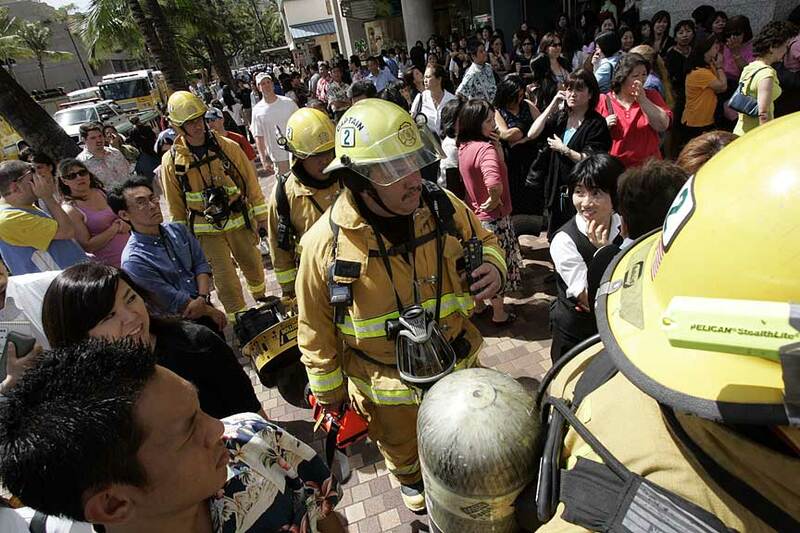 The fire was reported at 2:25 p.m. in the Top of Waikiki restaurant kitchen at the Waikiki Business Plaza, 2270 Kalakaua Ave. The fire got into the exhaust system of the kitchen on the 21st floor, said fire Capt. Frank Johnson. An automatic sprinkler system and restaurant workers using fire extinguishers had nearly extinguished the fire by the time firefighters arrived, Johnson said. The restaurant was closed at the time. The building was evacuated for about 45 minutes, Johnson said. An autopsy determined that drowning was the cause of death for the 37-year-old US Airways pilot who was found unconscious off Kalalau Beach Friday, Kauai County officials said yesterday. Theodore Teichgraber of Phoenix was snorkeling along the Na Pali Coast on Thursday. Another US Airways pilot reported him missing when he failed to return to Kee Beach, police said. A tour boat crew spotted Teichgraber Friday at about 11 a.m. A Coast Guard helicopter and personnel retrieved him from the water and he was taken to the hospital in Lihue, where he was pronounced dead.